In our continuing commitment to providing the best care and support for our race horses, we installed an equine therapy swimming pool which opened in 2003. The pool is one of the few of its kind at racetracks in America. It provides complete cardiovascular conditioning without incurring the stress to the race horse’s legs and joints associated with on-track training. Many horsemen find that the use of this therapeutic equine swimming pool extends a race horse’s career by an average of five races a year. The oval shaped pool, located in the stable area, is 12 feet deep and it measures 30’x 60’ which makes each lap 150 feet of swimming. 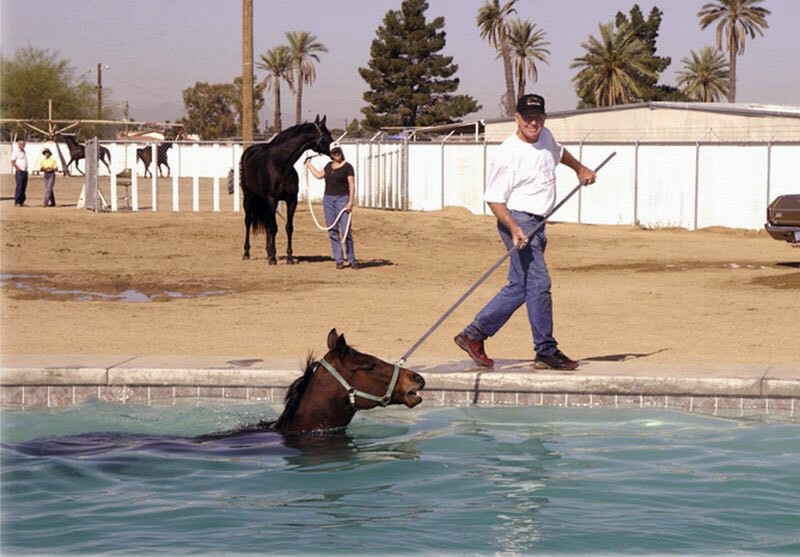 The pool is only accessible to horsemen licensed by the Arizona Department of Racing (ADOR.) It is open on live race days from sunrise to 10 a. m. Tickets are $9 per session and can be purchased in advance from the Horsemen Bookkeeper and from the AZ HBPA.